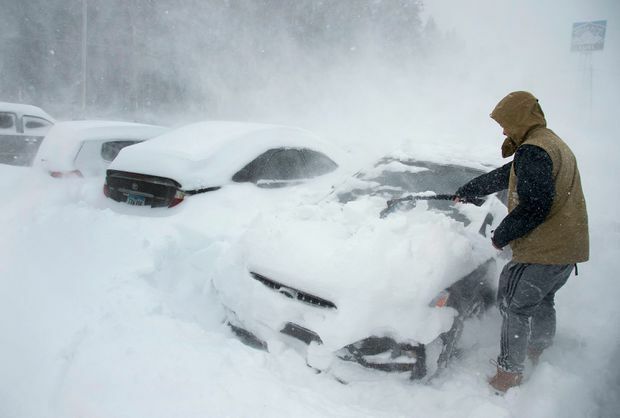 In this March 1, 2018, file photo, heavy winds blow snow as Ryan Foster scrapes snow from his car near Donner Summit, Calif. Living with your car in the throes of winter doesn’t have to be as difficult as you think. With a little planning and ingenuity, you can avoid some of the travails that come with snow, ice and sub-zero temperatures. Of course, a good set of winter tires is a must, as is an effective scraper and brush to clear your car of ice and snow. You might even want to have an emergency kit with candles, energy bars and extra clothes, or a blanket packed in the trunk. Beyond the staples, we’ve compiled a few life hacks to make your winter commutes just a little more bearable. How about placing kitty litter on the dashboard at night, turning on the air conditioning rather than the heater, or wrapping side mirrors in plastic? If you’re parking outside, and if at all possible, point your car to the east before tucking in for the evening. That way, the rising morning sun will help clear frost off of your windshield. If it’s cloudy it won’t work, of course, but you can’t predict the weather, can you? in this foul weather, those kids in the car seats can’t stop making the back of your seats filthy with their boots. But you can stop the carnage with a towel or even an old diaper change mat, hung from the seat pocket in front of them. The change mat is especially good because of its waterproof qualities. Another solution is the Stuff ‘n Scuff protector which also stores small items and can be easily removed for a rinse-off. Need to clear your foggy windshield in a hurry? Turn on your air conditioning. Sure, that’s counter-intuitive in the winter months, but the cool air blowing on your windshield will dry off the glass faster than trying to blow heat. It won’t take long – less than a minute – so you won’t have to endure the A/C in sub-zero weather. In this Dec. 16, 2016, photo, kitty litter products are displayed at a local store in Cheyenne, Wyo. To avoid the fogged windshields altogether, put some silica kitty litter in a sock and leave it on the dashboard overnight. The litter will absorb the moisture that will otherwise coat your windshield interior. Another method is wiping down the interior of the windshield and other windows with simple shaving cream, which has many ingredients as commercial de-foggers. Speaking of kitty litter, a bag of it stashed in the trunk will help you get unstuck from a slippery situation. Just sprinkle a few handfuls in front of each wheel for more traction on icy surfaces. If you forgot the kitty litter but still find yourself spinning your wheels, your floor mats can be used in a pinch. Put the mats in front of the drive wheels for better traction – just remember to pick them up before you drive off. Want your heat to come on faster? If you have manual HVAC controls, don’t turn the heat on for a couple of minutes. Your heater acts as a mini radiator, so if you have the fan blowing across it at full steam, your engine is going to take longer to heat up – which means longer for you to heat up, too. Have some patience. If you park outside and your car doesn’t have fancy mirror warmers, keep them ice-free by slipping plastic bags over them when you park for the night. The same goes for your windshield wipers, which often freeze solid to the windshield and are practically useless if caked with ice. Better still to also keep your windshield wipers up and off the glass entirely. Though most cars today have key fobs and automatic locks, some of you out there will still have to use your keys to get inside the vehicle. If the locks are frozen, try putting some hand sanitizer on the key before you put it in the lock. The alcohol in the gel will help melt the ice inside the lock cylinder. Of course, you should have an ice scraper/brush with you at all times. But if you don’t, and you find your vehicle’s windows frosted over, the answer could be in your purse or back pocket: use a credit card to scrape the glass clean. And then drive to a store to buy a proper scraper. If you find your doors sticking on cold mornings, try coating the rubber seals with a thin film of cooking oil or even WD-40. Just wipe it on with a paper towel – but not too much, as you don’t want it to drip all over or collect grime. And don’t use petroleum-based lubricants, as they degrade the rubber. Whatever you do, do not use hot water to clear off an iced windshield – unless you want to ruin your day. Yes, it will do the job very well; it will also crack the glass instantly, and a new windshield will cost hundreds of dollars to replace. Bonus entry: Picking up a pizza for the family after work? Help keep it piping hot by putting it on the passenger seat and turning on the seat warmer. This would work at any time of the year, but especially when your car is cold. After multiple coolant flushes, my car heater still only works on one side. What now? Are special lug nuts needed on winter tires?